Say hello to Jangle Braces, a lovely Christmas Braces Boy. He is made of traditional gold South African mohair, quite thick and tufted with a silver metallic thread running through it. His trousers are made of gorgeous light blue Schulte Kid mohair. This means the fur is made from one of the first three cuts of the kid (baby goat's) coat. The two colours go well together and we have added white ribbon braces edged in silver thread. Jangle Braces has pale blue ultrasuede pads and pale gold ultrasuede paws. He is steel shot and steel ball filled for weight, has a gorgeous silver metallic thread nose and shiny black German glass eyes. I don't know about you, but I don't like to put Christmas bears away once the festival is over but with Jangle Braces, you don't have to. He may have a Christmassy name, but he looks good at any time of the year. He costs £45 plus postage, I do hope that you like him. 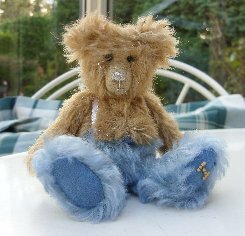 Please note that as with all our bears, Jangle Braces is not a toy and is not suitable for children. Sorry - Jangle Braces has been adopted.